Stittco Energy is a Canadian company that has been operating in Northern Manitoba, Northern Saskatchewan and the Northwest Territories for over 35 years, distributing propane and installing an d servicing related equipment. The retail propane division owns and operates six branches in Western Canada. These outlets supply propane fuel and tankage to residential, commercial and industrial customers. Stittco Utilities Man Ltd. and Stittco Utilities NWT Ltd. are wholly owned gas utility subsidiaries of Stittco Energy. The Manitoba subsidiary supplies the city of Thompson with propane gas, and also operates two smaller utility systems in the Manitoba communities of Flin Flon and Snow Lake. 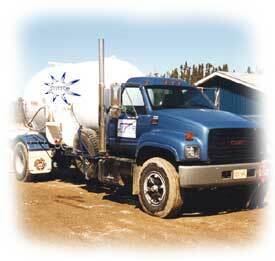 The Northwest Territories subsidiary supplies propane gas to the town of Hay River. To optimize and guarantee a supply to our customers, Stittco has contracted for underground storage in Alberta and Saskatchewan. This storage arrangement adds product supply and ensures deliveries during high winter use periods. Propane is a safe and efficient energy source that is reliable even in Canada’s harsh winter weather conditions. Thousands of residents in Northern Manitoba have depended on propane for their heating, cooking, hot water and clothes drying needs for over thirty-five years. Large corporate groups that operate multiple dwellings also use propane as their primary energy source, and count on Stittco to provide maintenance and servicing. Whether you are a commercial, industrial or residential customer, Stittco is committed to meeting your needs by providing energy sources that are cost competitive and can be efficiently distributed and serviced. Stittco Energy’s head office is located in Calgary, placing management in close proximity to energy suppliers. This contact maximizes our ability to provide competitive products to existing and potential customers. Stittco’s strength is its employees, whose experience in gas operations comprises hundreds of work years. Another key to successful sales and servicing of our products is the location of our operations. Branch operations are located in the Manitoba communities of Churchill, Flin Flon, Snow lake, The Pas and Thompson, and in Hay River, NT. As part of our commitment to the communities we serve, we employ local residents and train them for opportunities within the Stittco organization. In addition, where feasible, we obtain supplies and services from within the various communities we serve to support the local economies. Stittco is now part of the Superior Propane family. Together, we are committed to serving as industry leaders in safety, efficiency and innovation, and are always looking for talented people to join our team.